The National Geographic at its June 2009 issue carried an article on the global food crisis. A few weeks ago, a friend told me that he thought the article was discrediting China as one incident it reported was the traditional celebration dinner of a Chinese company treating over 3000 employees at a banquet of 13 courses. The incident could be true as some Chinese industries were very successful a few years ago. But it is also a reminder of the global food crisis we could be facing. In the 18th century, there was Thomas Robert Malthus, well-known then for the term "Malthusian collapse". The world was enjoying the success of the French Revolution, and many academics predicted that there would be a continued improvement of human conditions. Malthus did not think so. He observed that the human population was increasing at a geometric rate doubling every 25 years, while agricultural production increased arithmetically, or slowly. It was a biological trap that human could not escape. He wrote that there would be a strong and constantly operating check on population from the difficulty of subsistence. Malthus thought such checks could be voluntary, such as birth control, abstinence, delayed marriage; or involuntary, through the scourges of war, famine, and disease. In short, Malthusian collapse states that the growing population would collapse when there was not enough food; and that it would re-adjust itself automatically through catastrophic means. This happened many times in human history. Malthus was proven wrong and his theory went into the dustbin. The growing world population did not lead to a catastrophe. The first saviour was the industrial revolution. Mechanized farming opened up more land for agriculture and the amount of food production increased dramatically during that period. But it was the green revolution that truly made Malthus a laughing stock. Since Malthus' time, the world population increased by six billion more people. However, owing to improved methods of grain production, most of the population were fed. The green revolution was not the present day cult of environmentalist movement. The last world famines occurred in the 1940's, when four million people died in Bengal and India had to import millions of tons of grain to feed its people in the next two decades. The green revolution came in the mid-1960's. Under the co-operated effort of the Indian researchers and the American plant breeder Norman Borlaug, high-yielding wheat varieties were introduced. Crop production was tripled. The new crops grew fast as long as there was plenty of water and synthetic fertilizer and little competition from weeds or insects. As such, the Indian government subsidized canals, fertilizer, and the drilling of tube wells for irrigation and gave farmers free electricity to pump the water. The new wheat varieties quickly spread throughout Asia, changing the traditional farming practices of millions of farmers. This was followed by new strains of miracle rice, which matured faster and enabled farmers to grow two crops a year instead of one. Gradually, the green revolution lost steam and crop production stabilized. But the world population kept on increasing and the supply of food was being stressed again. 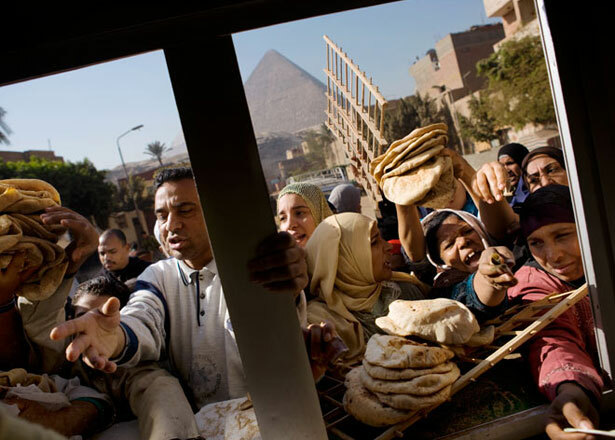 The sudden surge of food price in 2008 was a wake up call. During a three year period leading to 2008, the price of wheat and corn tripled and rice climbed five-fold. This price spike came in a year when the world's farmers reaped a record grain crop. However, after years of drawing down stockpiles, in 2007 the world saw global carryover stocks fall to only 61 days of global consumption, the second lowest on record. now calling a perpetual food crisis. With world population spiraling toward nine billion by mid-century, the experts of the green revolution now say we need a repeat performance, doubling current food production by 2030. In other words, we need another green revolution. And we need it in half the time. On the face of the urgency, the adverse consequences of the green revolution emerged. With the use of synthetic fertilizers and pesticides to nurture vast fields of the same crop, it created the practice known as monoculture. In India, over-irrigation has led to steep drops in the water table, while thousands of hectares of productive land have been lost to salinization and waterlogged soils. Many crop scientists and farmers believe the solution to our current food crisis lies in a second green revolution, based largely on our newfound knowledge of the gene. Scientists hope that genetic modification, which allows breeders to bolster crops with beneficial traits from other species, will lead to new varieties with higher yields, reduced fertilizer needs, and drought tolerance. Remaining areas of land to be developed for agriculture are in Brazil and Central Africa, with the price of destruction of the tropical rain forests. Ecologists are much alarmed at the push for a new green revolution in Africa. Notwithstanding the elusive solutions, the challenge of putting enough food in nine billion mouths by 2050 is daunting. Two billion people already live in the driest parts of the globe, and climate change is projected to slash yields in these regions even further. No matter how great their yield potential, plants still need water to grow. Climate studies projected that heat waves which could wither crops would become more common in the tropics and subtropics. In the worst-case scenario, water shortage could decline yields for some grains by 10 to 15 percent in South Asia by 2030. Projections for southern Africa are even more dire. All the while the population clock keeps ticking, with 2.5 more persons to feed born every second. This inevitably leads us back to Malthus. The horrifying thought is that Malthus could be right after all. Eventually, the population will out-grow food supply and there will be a painful adjustment.